In an interview during her recent Journey To Cambodia video for Louis Vuitton, Angelina Jolie talks about how her boys "love to eat crickets." "It's their favorite thing," she said. "They ate them like Doritos. As soon as we landed (in Cambodia) we had a friend bring us two to-go boxes full of crickets, and we all sat in the car eating them." This globe-trotting family has it right -- crickets are good eating. Crickets, on average, taste vaguely like a cross between a shrimp and an almond, and are highly nutritious: when dried, they rival beef pound-for-pound when it comes to protein, and far exceed it in calcium and iron. Meanwhile, they are remarkably sustainable to raise, requiring so many times fewer resources than most livestock that it's like comparing an S.U.V. to a bicycle. When preparing them, all crickets should probably be initially processed in the same way - frozen first. Adventurous as you may be, cooking with live crickets is quite a challenge! Once frozen, there are two schools of thought as to what to do next. I prefer to rinse my crickets in a mesh strainer before I cook them, but Julieta Ramos-Elorduy, author of Creepy Crawly Cuisine and one of the foremost entomophagy (read: bug-eating) experts in the world, insists that this alters their essential flavor. Having tried her delicious cricket-cooking, I must say, she may have a point. In my opinion, the best way to cook a cricket is to saute it with garlic, olive oil and salt. This brings out and complements their delicious, light, nutty shrimp flavor. Begin by sauteing crickets in olive oil just as you would any other type of meat. Once they start to become a little golden and crispy-looking, you can add in the garlic (crushed or chopped) and salt. This is a fantastic topping for salsa, guacamole or tacos - seriously, when I serve any of these at events, a line forms and it all gets gobbled up. This is probably the best method for those still feeling squeamish about seeing the shape of their grub. Roasted crickets can be ground to a fine, nutritious powder in a blender or coffee grinder. This nutty-tasting meal can be added like a flour to baked goods, stirred into smoothies and pesto, or sprinkled on salads, soups, and even ice cream! The Eat-A-Bug Cookbook offers an excellent recipe for a honey-ginger sauce in which to marinate the little leapers overnight. 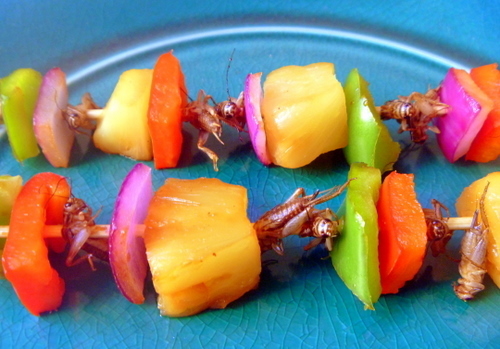 Gordon advises skewering with pineapple and peppers, wrapping the odd bug in bacon, and broiling for around 8 minutes. Land-shrimp on the barbie! Anything tastes good fried, right? Crickets are no different. Simply dunk them in tempura batter or dredge them in cornmeal, and then drop them in hot oil. When they turn golden, your "Cricket McBuggets" are ready to dip in your favorite sauce.